Not often is it a legitimate possibility that your average NBA fan may not even know who either of the players involved in the Poster of the Day are. I suppose I’ll introduce them. 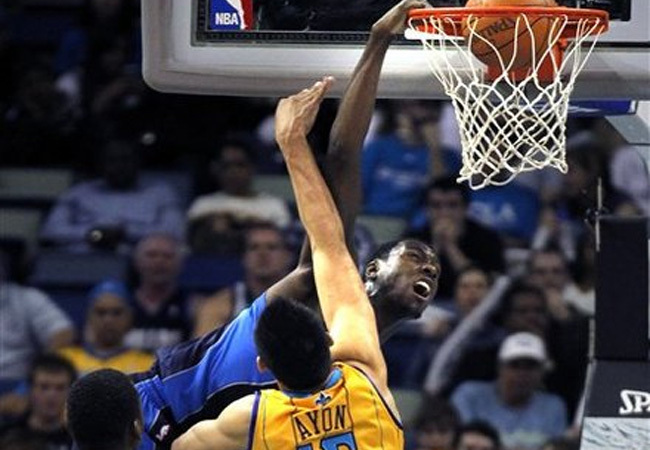 Ian Mahinmi is a high-flying, seven-foot Frenchman who’s played regularly for the Mavs this season. He did make brief appearances during last season’s title run, but he’s hardly a household name. As for Gustavo Ayon, I first heard of him… maybe two weeks ago. He’s a rookie forward who’s most notable accomplishment thus far is becoming just the third Mexican-born player to compete in the NBA. I’m not downplaying that feat; I’m just explaining why you may not know who he is. Well, Gustavo, you’re on Youtube. As long as you’ve got your smartphone no one will be able to question your NBA status. Congratulations on officially becoming the third Mexican-born NBA player. Readers, can you name the other two? Let’s see….are Najera and Horacio Llamas the other two Mexican players?